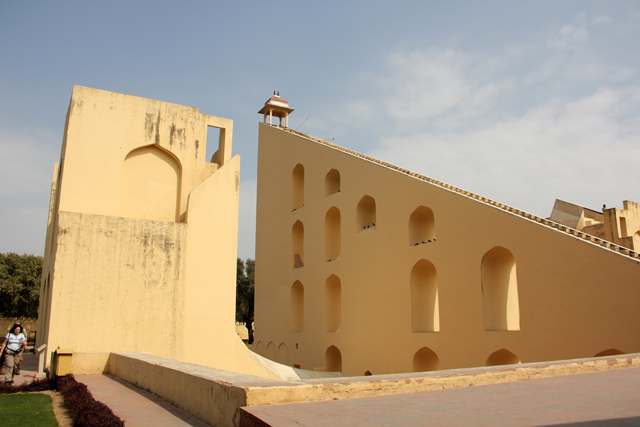 One of the most famous attractions in the heart of Jaipur, Rajasthan, is the Jantar Mantar complex. This series of giant instruments was built in the mid 1700's by Sawai Jai Singh of Rajasthan. 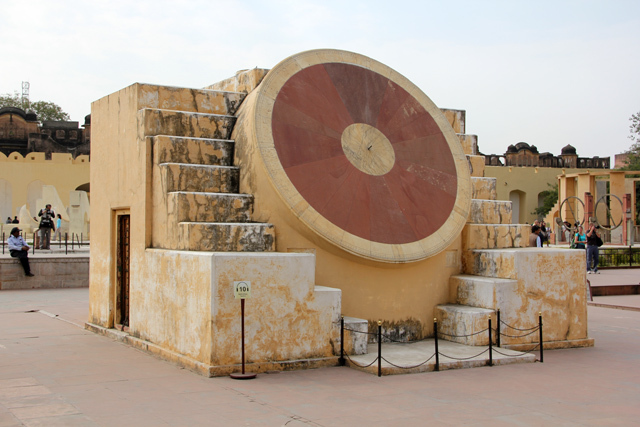 Jantar Mantar is a compound full of geometric sculptures dedicated to making astronomical observations, things like telling the time, forecasting the moon cycles and earth cycles, measuring celestial objects, and predicting eclipses. The site is now a UNESCO World Heritage Site for its design, preservation, and the precise measurements it records. When I first arrived, I though the complex just looked like a bunch of abstract pieces of modern art sculpture – the kind that only really make sense to the artist and are used as decorations outside of large building or in public spaces. But the more I hung around, observed each and every instrument, and read the description of what each sculpture was used for, I gained a much broader appreciation for this attraction. The instruments were mainly constructed of local stones from Rajasthan and marble, and though it remained in quite good condition, it was restored in the mid 1900's to what it is today. The reason many of the instruments are so large is to make them more accurate, a bigger surface area to cast shadows and show measurements. The nadivalya yantra looked almost like an artistic house, a set of stairs leading around a large circular disc. The equatorial sundial was used to tell time in relation to the Earth's axis. 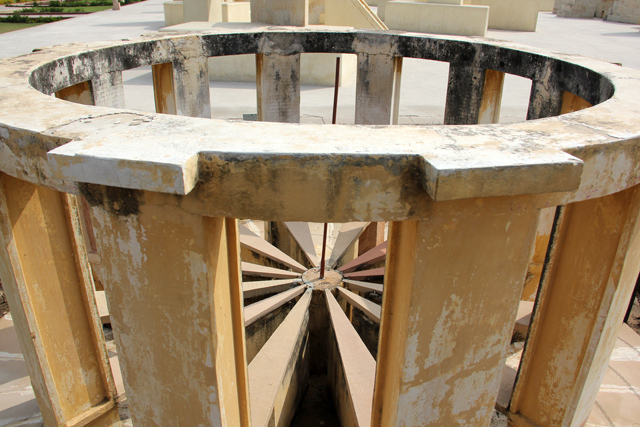 There are a number of Ram Yantra instruments at Jantar Mantar. They were mostly used to tell the coordinates and azimuth (which I had no idea what it was until my visit) of objects in space. Somehow the ring and the top of the structure makes a shadow that falls on one of the inner triangular-shaped radials. Another instrument, known as the digamsa, was used to determine the azimuth of a celestial object. I'm not sure exactly what the measurement was useful for, but its pretty cool that they could do such complex calculations. 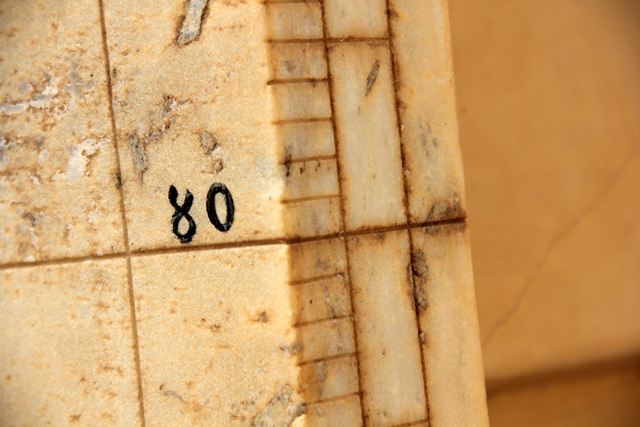 Pictured, you can see the acute markings etched into the stone. The most impressive of all the monuments, or the supreme instrument as it's known, is the Vrihat Samrat Yantra. This huge triangular structure is a sundial, and as the sign indicated, it has the ability to tell time to an accuracy of 2 seconds. Now I don't begin to even come close to understanding how the sundial really worked, but somehow the sun shining on the triangular wall cast a shadow that moved with the sun and indicated the time. Something so giant to tell the time, and yet it worked with precision. 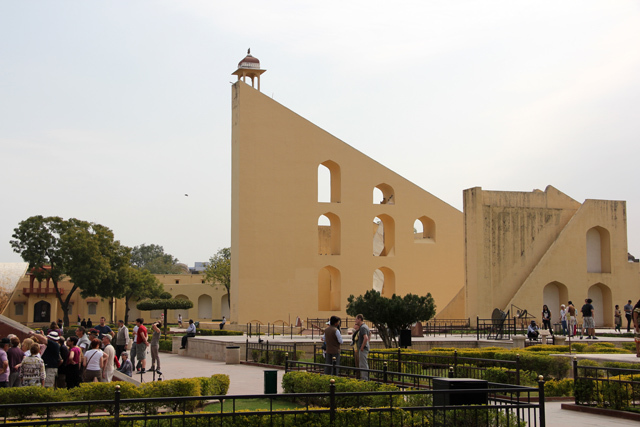 The Vrihat Samrat Yantra is 90 feet tall, making it the largest and most important structure at Jantar Mantar. 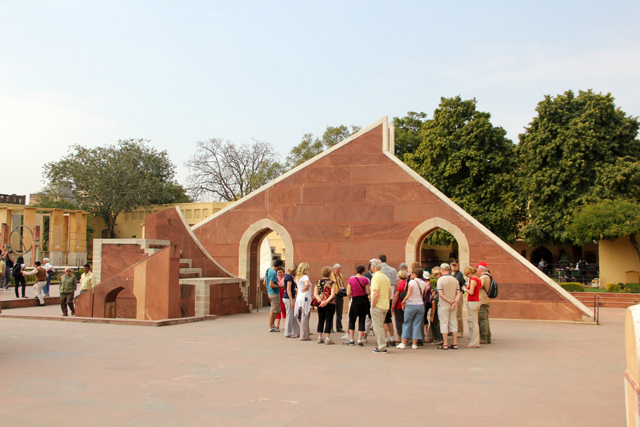 There's also a very similar Jantar Mantar complex in Delhi, built also by Sawai Jai Singh, but it's not quite as well-preserved or as large as the complex in Jaipur. Fourteen different objects, all precisely crafted to observe the stars and planets, measure the time, and trace celestial objects, makes for a pretty interesting attraction in Jaipur. It seems so rustic but there’s something very beautiful about it! Jantar Manter is one of the beautiful heritage of Jaipur. Its a way to know the time without watch. You know its also provides your future. I really like it.